My Sweet Hubby (MSH) and I were sooo lucky, this past weekend, to have Little Leighton (LL) come stay with us! TLC and her hubby had lots of things to do and needed to be able to do them sans their almost 2-year-old. We met TLC in Ft. Worth to pick LL up Friday and took her back to Ft. Worth yesterday. She reminds MSH and me so very much of TLC when TLC was a baby/toddler. Each time we see LL there is a new “thing” she does/says. This time, after learning about “bugs” a few weeks ago while two of our other grandchildren were visiting, we had “bug” alerts! 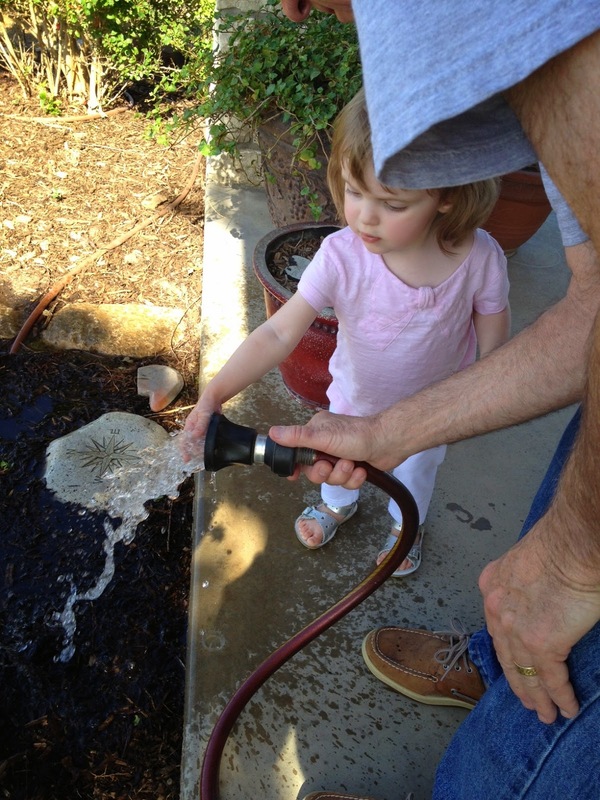 (Our almost 4-year-old granddaughter showed her some bugs while they were playing on our front porch.) LL would be looking out the French door in our master bedroom or our guest room (her Mama’s former room…) and then she’d come running. “BUG! BUG! BUG!” she’d scream in her tiny little voice. Mostly it would be roly-poly bugs. But we did see some wasps and grasshoppers. LL also learned about “buzzards.” We have a lot out here in the country! So I must add Buzzard Alerts to LL’s Repertoire of Cuteness. This month of May, as TLC and I honor “Motherhood,” I simply cannot understate how FABULOUS being a Grammy is! It is positively, absolutely, cross-my-heart THE BEST. Here’s a picture of Princess Little Leighton helping her Pa-Pa water some ivy on our front porch. Like most kiddos, she’s all about water!